Robust, earthy and rich, this sauce pairs well with assertive foods like beef, pork, poultry or vegetarian sausage. Pat steak dry and sprinkle with salt, pepper, and thyme. Heat oil in a 12-inch heavy skillet over medium-high heat until it shimmers, then sear steak, turning once, about 6-8 minutes total for medium-rare. Let steak rest on a platter, uncovered, 10 minutes. 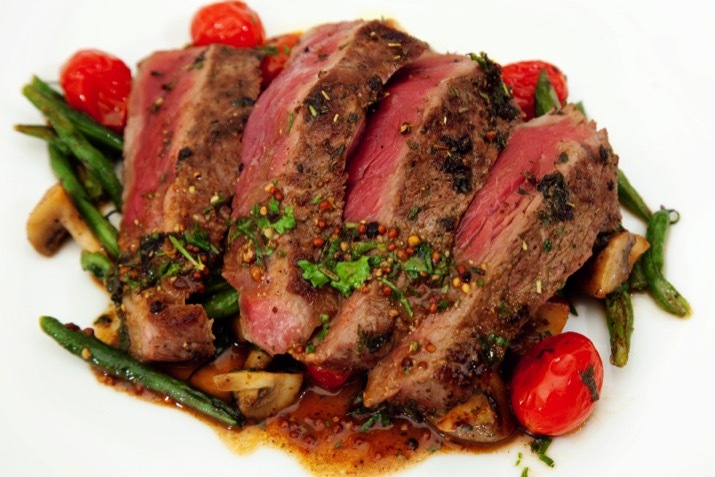 While steak rests, add shallot to skillet and cook, stirring, until softened, about 2 minutes. Add whiskey and carefully ignite with a long kitchen match (use caution; flames will shoot up). When flames die down, whisk in stock, sugar and mustard and boil until sauce is reduced to about 1/2 cup, about 6 minutes. Add meat juices from platter, then whisk in butter and parsley. Serve steaks on top of a bed of sautéed vegetables, like the green beans, mushrooms and tomatoes pictured, and drizzled with sauce.